This is one of the first stop-animations I made using the cut paper method. It is a fast and fun way of doing animation. All of the art is mine...and I move the characters by moving the paper which is cut and placed on a background. This story is based on my sister's cat...crummy. She is an old cat that is very set in her ways. She loves to sleep on the steps of the staircase...which is dangerous, if you don't see her. She also is a beggar....and will follow you into the kitchen meowing for food every time. Crummy is bad about wrapping herself around your feet while you try to walk...also very dangerous! 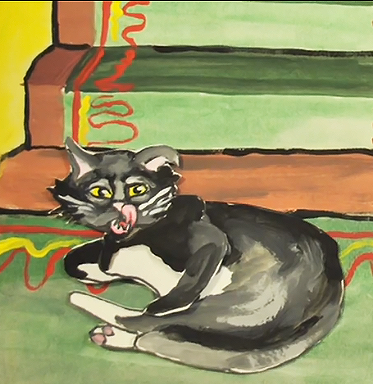 This animation is joking about the bad habits of cats as I was learning more about Final Cut Pro. Final Cut Pro is a program used mostly for videos...however...you can also use it to make animations...which is what I use. It is a large and complicated program...but well worth the trouble to learn if you want to make animations. It has great features you can use to adjust timing on a frame...adding sound and music...and placing two videos in the same frame, I use this feature in this cartoon...during the TV scene I have a second animation playing in this frame to show the TV in the background. I am currently working on a few more animations and videos and will post them in due time. Since this is officially my first post....I will be posting more as soon as possible. This site looks a bit dead right now! If you are unable to see the video below...please let me know.